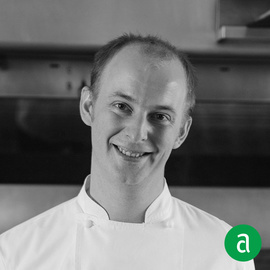 François Hiegel, Executive Head Baker at Restaurants of Chef Thomas Keller in Yountville, CA, shares his career timeline and advice for up-and-coming talent. The Arts Club (London) Ltd.
My first job at a small bakery in France taught me what it meant to be passionate. If you’re in this field for the paycheck, it won’t work, you need to be passionate to keep progressing. Nowadays, thanks to machines and equipment, baking isn’t as laborious as it used to be. Still, it requires time and passion so don’t rush things. You also need to be extremely organized. My ultimate goal is for others to be better than me one day. To stay motivated — even when I feel like giving up — I make sure to focus on the goal that I’ve set for myself and then I remind myself to keep trying until I’ve achieved it. At Thomas Keller Restaurant Group, there is no limit on creativity. I push my team to use this incredible opportunity that we have to be as creative as we want. We research a lot and play with ideas. I encourage them to try and test new things. If they struggle or fail, I’m there to guide them towards success. You have to consistently be open and accepting of new ideas in order to keep growing. Chef Keller challenges me with ideas that push me to learn and focus on new things. When it comes to baking, every day is different. We have to adapt to the changing weather conditions to produce bread that stays consistent.